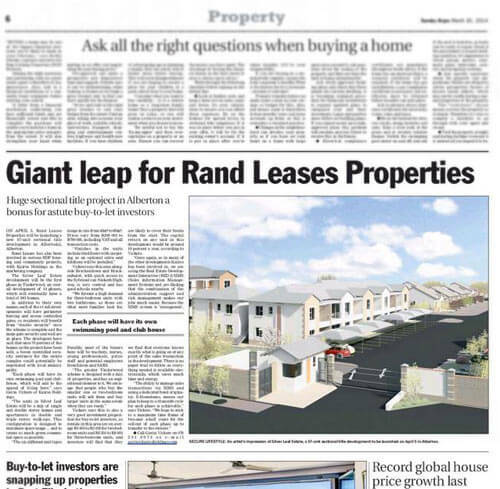 On the 5th April 2014, Rand Leases Securitisation, with Rand Leases Properties undertaking the development and Kairos Holdings as their marketing company, will be launching a new 67 unit sectional title development in Albertsdal, Alberton. The development, which will be known as Tinderwood Village, will be the first phase in an overall development of fourteen phases called Silver Leaf Estate, which will eventually have a total of 981 homes. Each of the fourteen sub-developments will have their own names, perimeter fencing and access controlled gates and will, therefore, benefit from “double security” once the scheme is complete and the main gate security and full walling is put in place. The developers have said that once they have reached 70% sell out on the project, a boom controlled security entrance for the entire complex could potentially be negotiated with local municipality. The units in Tinderwood Village will be a mix of single and double storey homes and apartments in double and triple storey walk-ups. This configuration of the units has been done in such a way as to maximise on space usage in the complex and to create as much green communal space as possible, says Gavin Vickers of Kairos Holdings. Furthermore, he said, each phase will have its own swimming pool and clubhouse, which will add to the appeal of living here. There are six different unit types and they range from 40m² to 80m². The prices range from R399 000 to R799 000, including VAT and all transaction costs. Finishes in the units include tiled floors with carpeting as an optional extra and full kitchens will be installed. There is ample parking space and each unit is allocated at least one carport bay. This area, alongside Brackendown and Brackenhurst, with quick access to the Sybrand van Niekerk Highway, said Vickers, is very central and has a number of good schools nearby, as well as various large retail centres. “We foresee a high demand for three bedroom, two bathroom units, as those are usually what families look for,” said Vickers, “with possibly most of those buying in here being teachers, nurses, young professionals , police and a wide range of potential employees from Edcon and SARS. Vickers says this is also a very good investment proposition for buy to let investors, as rentals in this area are on average R4 800 to R5 000 for two bedroom units and R6 500 to R8 000 for three bedroom units, which means that the investor will find that he is likely to cover his bond from day one. The capital return on any unit in this development would be around 10% per annum.